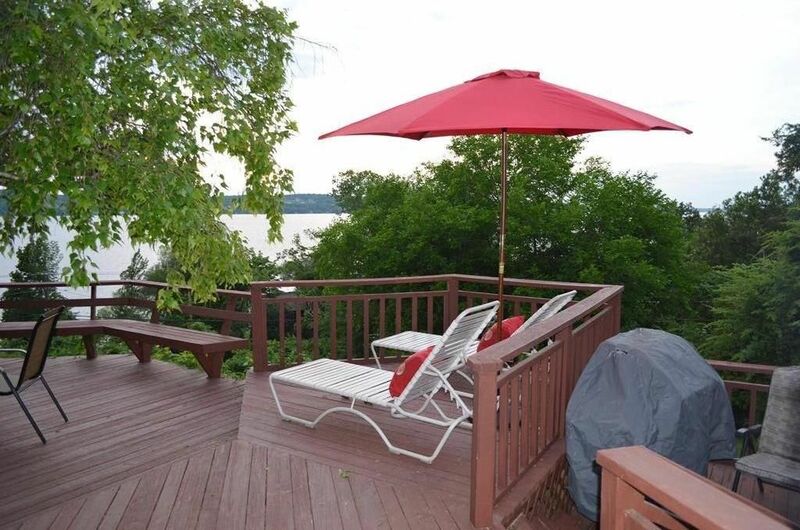 Canandaigua Lake Million Dollar Lake Views And Sunsets! Charming 2 bedroom, 1 bath year round lake house. Enjoy lake sunsets from the spacious wrap around decks. Newly painted and redecorated. Easy off road access with the privacy of feeling nestled in the rolling hills of Canandaigua Lake. Less than 1 mile to Pelican Point Marina, Deep Run Swim Beach and 4 miles to CMAC Performing Arts Center, Culinary Institute, Shopping, Antique Shops, Restaurants, Wineries, Brewery, Kershaw Park and much more. Close to Bristol Mountain Ski Resort and Naples. Perfect for couples, small family or small groups of friends. We moved to Canandaigua Lake Region in 2012. Truly have fallen in love with the lifestyle, people, restaurants, wineries, shops and everything this beautiful area has to offer. They call it 'The Chosen Place' for a reason!! When the opportunity arose to purchase Sunset Deck and be able to share this feeling with everyone, we jumped on it. We are excited for others to feel the tranquility and experience the enjoyment of the water, views and local offerings; which will be true memory makers. Adorably appointed and perfectly located close to everything!! Sliding glass door takes you out onto the spacious wrap around decks, all rooms tastefully painted, all bedding and quality towels, tv, pots and pans and accessories! Books, cards board games, magazines, dvds, internet and 200 Chnls of cable entertainment for a rainy day or on the deck. When walking into the property at our viewing... we both said, WOW! look at that view. The front on the house is a large picture window and sliding glass door. All you can see is the lake and greenery. Then we walked outside on the spacious wrap around deck... and said WOW! yet again. We couldn't believe we found this gem that is so close to all attractions, yet very private with all public utilities and easy access from road. Many properties in the area have steep driveways, this does not. Driveway is easily accessed right off the road. Quiet enough for rejuvenating getaways and close enough to everything to be smack in the middle of the action. Your choice! The Sunset deck is a very quaint & comfortable home. Although we didn’t get to enjoy the deck since the weather wasn’t cooperating it still provided some great views of Fall in the Finger Lakes. The kitchen while spacious does lack quality pans for cooking but we are probably in the minority of those that cook while on vacation! We enjoyed a trip to Ithaca for the Farmers Market and brought back grass fed beef and fresh vegetables for dinner. Yum! This is our 4th trip to the area and Canandaguia is located close by many great spots. We would stay at the home again and know what to bring from home this time. Beautiful view with a great deck. Took great pains to make our stay very enjoyable. When there was a problem with the city water they made sure we had drinking water. We love the area and all the attractions. Our visit was October 3-6, 2018. The spacious, multi-tiered deck was the jewel of this cottage. Whether sipping morning coffee or evening New York wine the spectacular view made every sip more enjoyable. The large picture window overlooking the deck and the lake prevented inclement weather from dampening the view. Little extras like a National Geographic telescope, a basket filled with local flyers and information, more than ample towels in the bathroom, and a kitchen stocked with every appliance one could need all made the visit more pleasant. A special shout out to Jonathon, son of the owner, who drove 45 minutes at night to handle a baseboard heating issue with competence and a smile. We enjoyed our stay immensely, and would recommend this rental without hesitation! Thank you Pam, John and Jonathan! A very comfy home and a spectacular sundeck to dine on. As we did every day. The view on the lake is gorgeous. The winetrails are close by and the overall scenery of the Finger Lakes is simply beautiful. Loved it! The house was in very good shape and well stocked with amenities. The view of the lake from the deck was a game breaker. We also greatly appreciated the location of the house, feeling somewhat off the beaten path, yet close to both highway stores and downtown pubs. We very much enjoyed our stay and would highly recommend the rental. A most relaxing and peaceful vacation! I can't say enough about the lovely cottage and the stunning views over the lake. Spending the evenings on the deck with a glass of wine from the Finger Lakes was so enjoyable! I would definitely recommend this spot to anyone wanting spectacular views and delicious wines and beers! Pat was a lovely guest of Sunset Deck. We are so happy you had such a wonderful experience and hope you return. Enjoy the rest of your summer!! Owner will consider SHORTER STAYS dependent on availability. Off season holiday rates may apply to regularly posted rates. Please contact owner directly to discuss availability and daily rates.